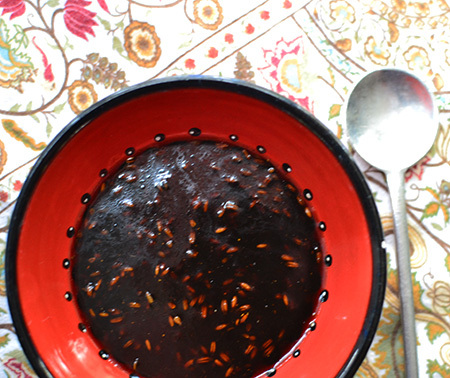 In late January, when I posted my recipe for Lamb Shahi Khorma, I made you a promise. 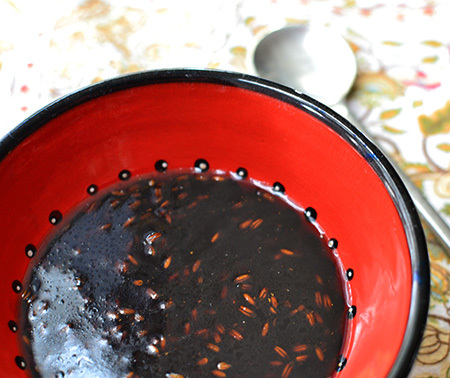 And that promise was to share my tamarind chutney recipe with you. Sorry it has taken so long. 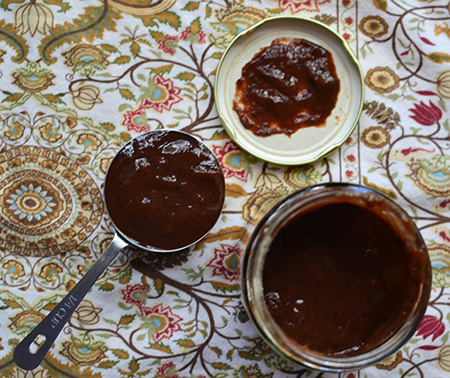 While many chutneys are more solid than liquid, this one is the opposite. It is syrupy, savory, and sweet. You may recognize this chutney as one of two traditionally served with those crispy papadums in Indian restaurants. It is one we use to make the sauce of our favorite eggplant and chickpea dish. Another promise to share. Eventually. Of course, it is a great accompaniment to many an Indian meal. Combine the oil and spices in a medium saucepan over medium-high heat and cook, stirring, for 1 minute. Add the water, jaggery (brown sugar), and tamarind concentrate. Bring to a boil, turn the heat down, and simmer briskly until it turns chocolaty brown and thick - about 1 1/2 to 2 hours. It will thicken as it cools. Store in the refrigerator in a tightly closed container for up to 2 weeks. Thank you for introducing me to different recipes. Your chutney looks fabolous . I am glad I am bringing new things to you, Gerlinde! Enjoy! You can definitely do this, Susan, and you have lots of of really good Indian dishes with which you could serve it! Such an interesting recipe, David. My Peter won't touch any kind of chutney, otherwise I might just make some. Thank you for sharing. As I said on Facebook, just don't tell Peter it's a chutney! Greg - Asafetida is an amazing spice. Just a pinch makes a world of difference! I love all those spoons!! Thanks, Paola - I love my measuring spoons even if some of them aren't exact measures! After all, for some recipes, exact isn't necessary! I adore this stuff. When I made a batch many moons ago, I had a container of it in the fridge for a couple of weeks. Probably longer, actually. I even went as far as spreading it on toast in the morning. Yep, I'm weird like that! Hmmmm, on toast? I might have to try that, John! Weird? No way - creative and loves good food! Sounds wonderful! 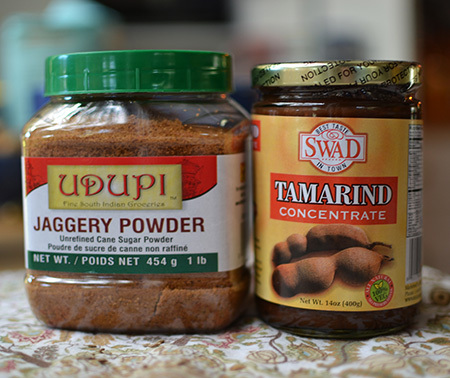 And I even have tamarind paste in my cupboard! 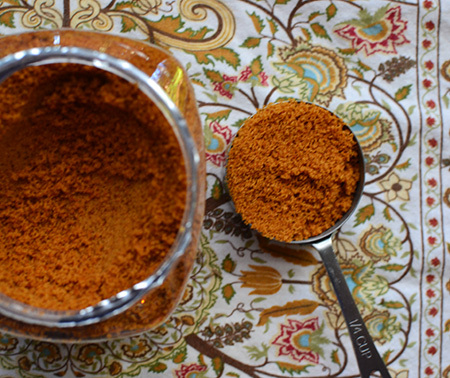 Mimi - I used to get the tamarind pods and make my own, but now that it is so easy to buy, I keep it around all the time! Your photos are gorgeous - and this recipe sounds wonderful. Thanks, Beth - glad you stopped by! 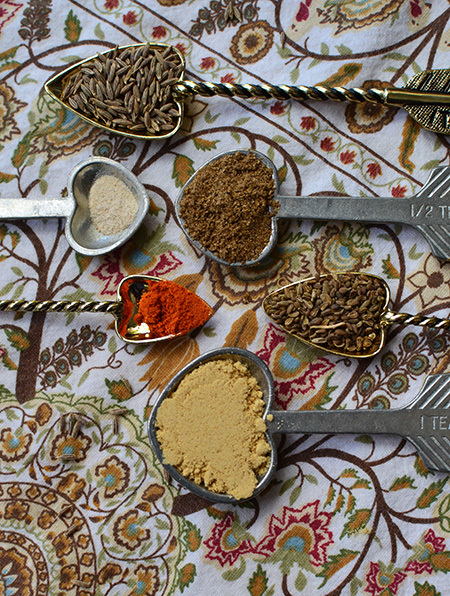 looking forward to your Indian recipes. Nazneen - I forgot to mention how good it is with samosas! Yes, I love that, too! Hi David, never had a syrupy chutney before, will have to try, looks fabulous. Also, love your spoons they are beautiful. I'm sensing a story. Cheri - I think the only story here is that I love different measuring spoons - kind of an obsession! And I am lucky that Mark knows that, too, as I usually get a really cool set every year for my birthday! I think chutney is one of the great joys in life David! How did I ever eat curry before I discovered it! I can green tomato & apple chutney every year or two (and have tried others). But I had never heard of tamarind and had to look it up. Looks awesome! Inger - This weekend, I am making both rhubarb and kumquat chutneys. Can't wait! I love the spoons, Gorgeous! How did Europe eat before India! Thanks, Cindy! That is a good question - but I can't imagine my life without Indian food! You had better hide the spoons! We all covet them! This recipe looks delicious and, with all the good spices, it must be full of lots of antioxidants, too. Spoons hidden, Susan - thanks fro the warning! This is a wonderful sauce - never thought about the antioxidants, though. What a great bonus! 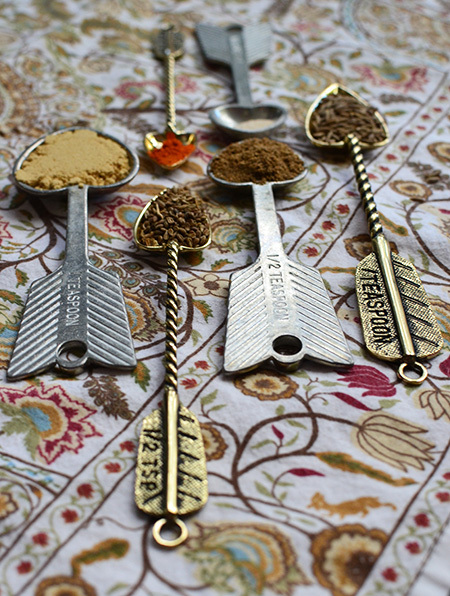 Those measuring spoons are so beautiful! Love chutney! Thanks, Angie! Seems like a lot of people love the spoons - I need to hide them! Thanks, Janet! I hope you enjoy t!